Does phosphate thin foram shells? 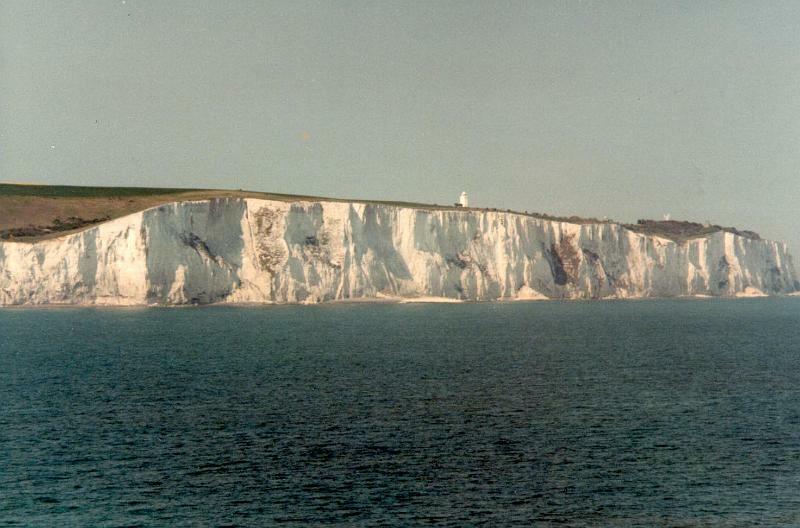 Whenever I look at the iconic White Cliffs of Dover I am reminded of an interesting fact: much of the south of England is made from plankton. Yes, the chalk (calcium carbonate) found here is predominantly composed of plankton – calcifying single-celled plankton to be precise– that sunk to the sea-floor tens of millions of years ago, was compressed to form chalk, and then uplifted into its present position. The two most abundant calcifying planktonic organisms forming this chalk are the coccolithophores, which form stunning blooms visible from space, and the foraminifera (‘forams’ to their friends). Forams, like many calcifying organisms in the ocean, are in the spotlight at the moment: ocean acidification may erode their calcium carbonate shells in the future, a consequence of anthropogenically produced CO2 dissolving into the oceans and lowering the pH. This lowered pH is a problem as it causes a shift in the ocean’s carbonate chemistry, reducing the concentration of carbonate ions, which forams (and other calcifiers) need to construct their protective casings. This sensitivity to carbonate ions also makes them a useful proxy for scientists trying to estimate atmospheric CO2 concentrations from the past. In order to fully understand how ocean acidification will affect forams, however, and in order to improve our ability to reconstruct past CO2 concentrations in the atmosphere, it is very important that we understand all of the factors that affect their calcification. In addition to carbonate ion concentrations, we also know that temperature is important – as forams are poikilothermic (their internal temperature, and therefore metabolic rate, varies with the ambient environmental temperature), temperature will impact many important metabolic reactions, including calcification. 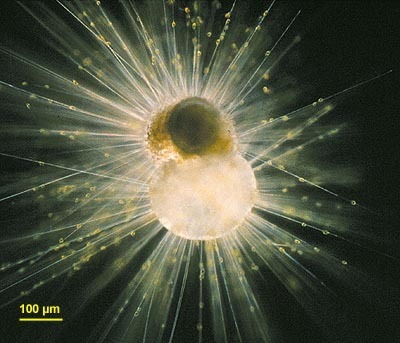 It is also suggested that forams calcify most when they are in their ‘optimum growth conditions’ – this is quite tricky to test: previous researchers have used foram abundance (assuming forams are most abundant in their ‘optimum growth conditions’), but it may be that the amount of food, the fertility of the water, or even modelled growth rates are best to assess this. In our study, which was my masters project a few years ago, we preserved seawater samples collected from the North Atlantic, picked out the forams belonging to a single species (we chose Globigerina bulloidesas it is relatively common, and there has been quite a lot of previous work done on it), imaged them, and weighed them in groups. This allowed us to work out what is known as the average ‘size-normalised weight’ of forams (for each of our sample sites), which is essentially a measure of their shell thickness, and therefore their calcification ‘rate’. I have reduced this method to a few sentences, but – as is often the case with science – it was considerably more complicated (frustrating): in order to image/weigh forams, you need to spend months picking them from seawater, washing them, drying them, and finally moving them around with a fine brush onto specially designed slides (for imaging) and then into aluminium capsules (for weighing). The slightest sharp move of the hand, or heavy breath, at any of these stages, tends to disperse forams to all four corners of the lab; I have not read one scientific paper that even begins to truly convey the frustration associated with this process. When we compared the shell weights from our sample stations to some of the in situ environmental parameters, we found something quite intriguing: although shell weights decreased at lower pH and lower temperatures (the story of how they responded to ‘optimum growth conditions’ was a little more complicated, so I won’t go into it here), the closest relationship by far was with phosphate – lower shell weights were linked to higher phosphate concentrations. This was the opposite of what we originally imagined might be the case: we thought, if anything, that higher phosphate concentrations would favour growth (as it would increase the amount of the forams’ algal prey) and therefore result in thicker shells. A little digging revealed that phosphate is quite a well known inhibitor of calcification: a number of studies on other calcifiers (from coccolithophores to corals) show this; nobody has seen (or to my knowledge looked for) this in forams though. Of course, any good scientist (although not every Daily Mail reader) will tell you that correlation doesn’t prove causation (especially true in the ocean where many factors co-vary together), so we have to be cautious with our finding – even though our trends are backed up by a known phenomenon. I look forward to seeing if our results can be repeated, perhaps by someone using forams grown in the lab and exposed to different concentrations of phosphate. If phosphate does turn out to adversely affect calcification then it will no doubt change how we look at foram calcification; in situ phosphate concentrations will have to be taken into account when looking at how forams respond to future ocean acidification scenarios, and also (ideally) when using foram shell weights as a proxy for past CO2 concentrations in the atmosphere. This blog-post is based on a published paper by the author. If you want to read more on the subject, and/or you prefer your information delivered to you in the third person passive voice, please click the link below.